Many of you may remember the debacle of 2014 involving FDA’s flip-flopping position on the use of wooden shelving in the maturation of cheese in which a public outcry and a social media backlash forced FDA to withdraw its ludicrous and unscientific position on the matter. Well FDA has been at it again, this time by establishing microbiological criteria that make the production and sale of some raw-milk cheeses nearly impossible. FDA quietly changed the microbiological criteria for strains of non-toxigenic bacteria from 10,000 colony forming units (CFU) per gram to less than 10, effectively regulating many raw-milk cheeses out of the market. You may have noticed that Roquefort, Tomme D’Savoie and other special French and Italian cheeses have been missing from counters across the country (or have been replaced by pasteurized versions of themselves…). Well they are coming for domestic cheeses next. The rub here is that there is no public health benefit to these new rules. Instead, many delicious cheeses that have long traditions and excellent food safety records may disappear from American cheese counters. This may seem like an esoteric issue, but it is a watershed moment for the future of artisan cheesemaking in the US. The rule making and regulations that are promulgated now will shape our industry for decades to come. WE NEED YOUR HELP….! The Vermont Congressional Delegation has taken the lead in circulating a letter in both chambers of the US Congress as a first step in addressing the issue with FDA. Find linked sample letters, and the letter the Vermont delegation is circulating in congress right now. 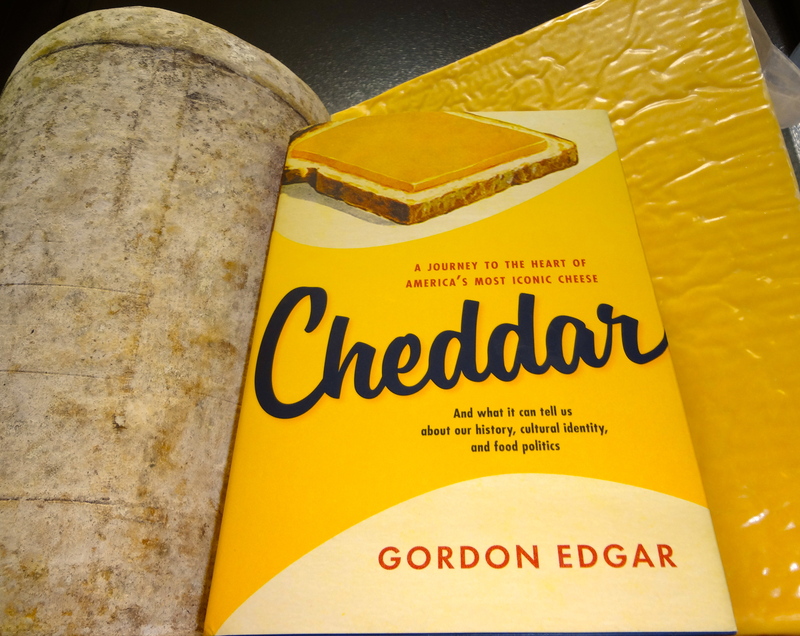 Since I am in that limbo-land between the time of my book being finished — in terms of writing and editing – and the book actually being printed, I’ve been thinking about why I write cheese books. I am more of a brooder than a quick, witty retort kind of guy. I like to mull things over for awhile, ask questions, read things… and for me the most effective way of thinking things through is to try and write about them. True, some half baked thoughts, missteps, dead ends and embarrassments may come first (in 2015 we usually call these “facebook posts.”) But eventually – at least I hope – coherency emerges, thoughts crystalize, I can start to say something that makes sense. Cheesemonger — only about 50 draft pages done — I sent it to an agent (not my current agent) because of a personal connection. I wasn’t really ready, and I should have waited, but the response I got was telling. Basically, if I would remove all the monger stories the agent would possibly be willing to sell it as a photo-based coffee table book. That’s cool. Heck, it probably would have been more profitable. But it’s not why I was writing. My cheese writing “career” started by accident. I had a LiveJournal* and only sporadically mentioned my day job. However, I realized than whenever I would make a cheese post, my comments section would explode. One day I made the mistake of asking if people had any cheese questions. Within about a half hour I had more than 50 questions. I couldn’t handle it. I didn’t have the time to answer all those! I deleted the post. But this outpouring of cheese questions showed me that there was need for more cheese writing. This was 2003 or so. There weren’t many cheese books back then. Indeed, I remember actually knowing the release dates and going to the book store to buy multiple copies of books by Steve Jenkins, Janet Fletcher, and Laura Werlin when they came out. It was tradition in our department that when someone found a new cheese book they would buy as many as they could and donate one to the department and then share them with everybody else. Even with these books though, there was still a thirst for cheese knowledge online. I started writing some LJ posts for fun and to learn more. I sought to answer the questions I was continually being asked, and I craved having a longer conversation about cheese than was usually possible over the cheese counter. Surprisingly, and this is why Cheesemonger was written the way it was, I also found there was almost as much interest in the job as the cheese. Relaying the workplace realities of someone working 40-some hours a week with cheese was my point: the conversations, the stories, the ironies, the compromises, and putting realities to the mysteries of cheese — not just the specific factoids and statistics that others could provide (and that might be out of date within a year or two) — made writing the book interesting. I was taken aback when Cheesemonger came out and I found out that wasn’t the way a lot of people write. In the food world especially, I was asked more than once how I went about hiring a ghostwriter. ** It seems there is a non-insignificant minority of “readers” who think you would only “write” a book in order to brand yourself. I was just happy someone wanted to publish it. Fast forward to the last few years. The cheese world has changed a lot. So has the internet. You can actually find reasonably good information on most cheeses online if you know where to look. So many readable, yet technical, books exist now*** that I am absolutely relieved of any responsibility to write at great length about the technical details of cheesemaking. Best of all, people started using the word cheesemonger unironically! On a road trip with the smartest person I know (my wife Laurie), we started talking about cheese and I realized that there was another cheese mystery I wanted to unravel. Why, when I started working in cheese in 1994, was American-made cheese the object of ridicule? I knew that there had been regional traditions of cheesemaking and long time cheese families. Why did they make the cheeses they do? Why did people who wanted fancy cheese demand imports? Why couldn’t Americans produce cheese as good as the Europeans? Is liking fancy cheese just too snobby for the regular American? So many questions… I realized that the key to understanding American cheese would be understanding cheddar, America’s most popular cheese for 150 years. 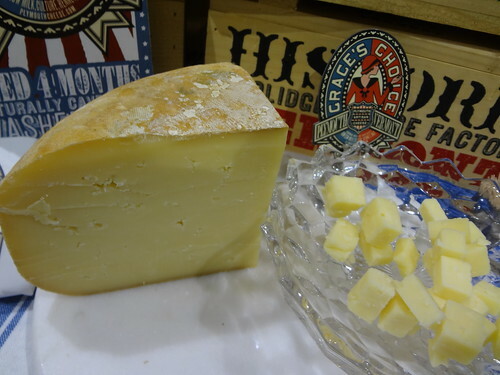 Cheddar lead to the industrialization of cheese, it took women out of the make-rooms, and it is beloved just about everywhere in this country in one or more of its many forms: the traditional cloth-bound wheel, the plastic-sealed block, or processed, emulsified, “American” single. And then I spent a couple of years, working on this idea, on and off. Reading and visiting. Chatting and interviewing. Writing and deleting. 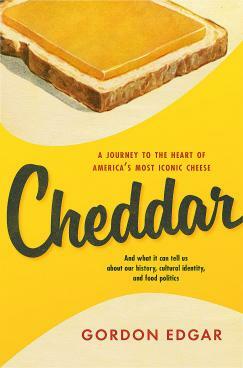 And after awhile I realized that not only was cheddar important for the reasons mentioned above, but cheddar also helped usher back in the cheese renaissance we are currently enjoying and which will forever change the reputation of American-made cheese. Good idea Laurie! 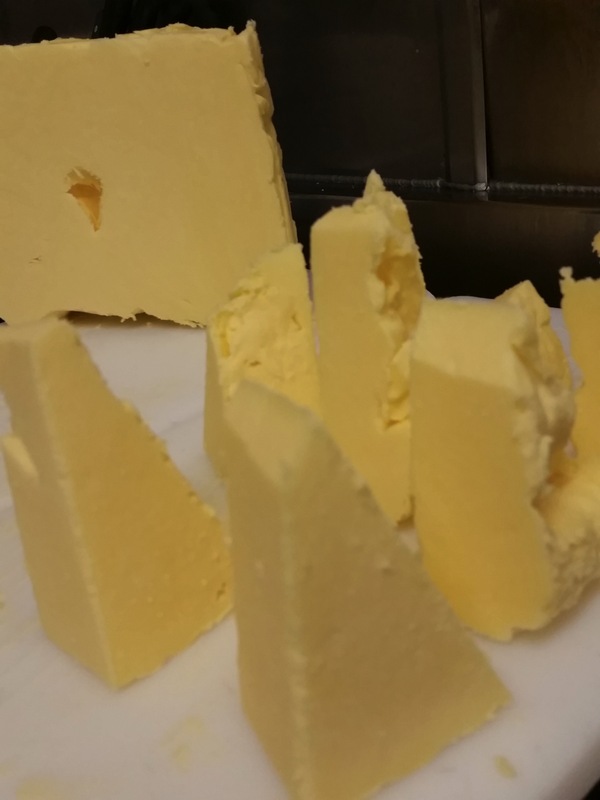 There’s a lot more than that in Cheddar (the book) – cheese road trip stories, tasting notes, cheddar factory poetry – but it started because I realized that even though I have worked with cheese for most of my adult life, I didn’t know enough about the most important cheese in the country. I also feel that writing is, in many ways, my duty. I am rooted in the realities of the co-op in which I work and the city in which I live. In a country that can be very divided along rural/urban lines I am lucky that my job gives me the opportunity to interact with people who live in very different places. If I am going to sell cheese from these places — which is where food comes from after all – I also feel the need to add what I can to the complexity of the issues and not just participate in trendy consumer shorthand that comes easily – and can sometimes take over – in a busy, urban grocery environment. Writing is my offering back to the cheese community that has nourished me in many ways. Writing is about answering my own questions while hoping those questions are interesting to others. Writing is my attempt to have a longer conversation than is possible over the cheese counter during the realities of a retail interaction. This is why I write cheese books. *LiveJournal was a community-based, semi-private, blogging platform that was state-of-the-art, pre-facebook. **Now, none of these people had read my book. I assume they just looked at me and decided I couldn’t write one and must have hired someone. I consider this a slight against the honorable profession of ghost-writing. How did they know my book wasn’t terrible? ***Max McCallman/David Gibbons, Gianaclis Caldwell, Paul Kindstedt, etc. just to name a few authors, all with multiple books. 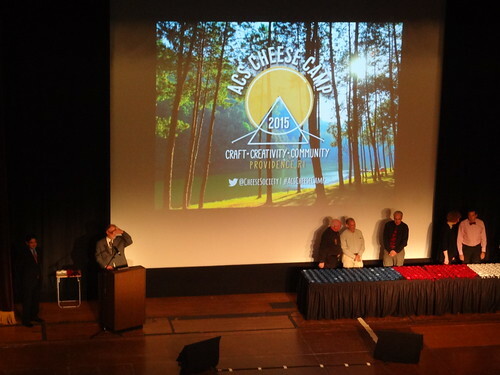 I almost didn’t go to the American Cheese Society conference this year. I often skip the East coast years of the rotation due to time and expense. Plus, this year my awesome co-worker Megan had won a trip to Vermont and would be there officially repping the store. But then I realized two things. One, I have a book coming out in October so it would probably be a good idea to remind people I’m alive, especially since I went blog-absent for about a year and limited my social media while I finished working on it. The second reason was less tangible and more personal: I just miss the conference so much the times I don’t go. So I worked it out. I flew across county to be there for two days. Unlike years past I have no reports from the judging room, no farm trip stories, and very few pictures. But I am still glad I went. It’s just totally rejuvenating to see so many great people all in one place, in a cheese-rich environment. It’s also amazing to see so many people putting in so much work to make it happen. I worry about trying to list people because, when you do, you always leave people out. Since this was my first year in a long time that I was just an attendee, I was reminded as an “outsider” how much effort it takes to put on the event that can look seamless if you aren’t in the conference rooms before and after an event. Thanks to everyone involved. As for the conference, I went to a great panel on “The Science of Artisan Cheese.”* It was so encouraging to see the linkages being created between traditional cheesemakers in different countries and the microbial science community. Most of the actual facts relayed were depressing: the FDA using ridiculously outdated testing, non-pathogenic bacteria being treated as an indicator of pathogenic bacteria, one-size (and that size is BIG)-fits-all rules. But the amount of people in the room, and the quality of knowledge of the presenters AND the audience… we have to acknowledge that we have come a long way in a very short time. Some folks left discouraged, but I left energized. 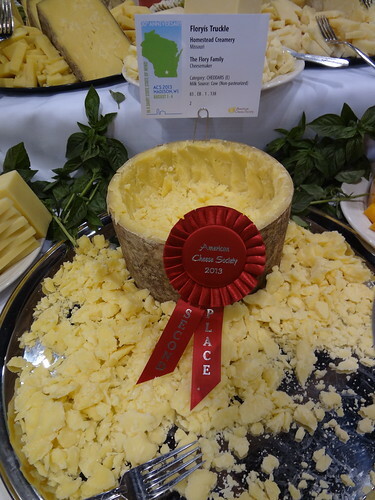 Cheese-wise, I didn’t even get a shot at tasting the Best in Show (first time ever!). But I loved the LaClare Cave-Aged Chandoka (aged by Standard Market) which was runner-up and I have raved about the 3rd place Harbison by Jasper Hill Farm many times before. I had a few other favorite new-to-me cheeses as well. I’ll post about them in the upcoming days. See you all in Des Moines in 2016. *In just one of the amazing ways in which the cheese society has grown, I used to feel obligated to sum up all my panels for cheese people and interested folks who couldn’t attend. Back in 2002 or whatever, resources were fewer. Now they are all re-capped on the ACS website. Just awesome. I’ve lost track of how many ACS conferences I have attended. I pretty sure I have attended every one not on the East Coast since 1999. Almost universally, they have been awesome experiences that have taught me innumerable things about cheese and introduced me to people I otherwise might never have met. Back when I first started going, there were only about 300 people attending the conferences but still, I didn’t know anyone except for a handful of California cheesemakers. While I am sometimes good about faking it, I am actually kind of shy by nature, so I am humbly going to attempt to produce a guide that I would have found useful back in the day. I’m sure this advice will be weighted to the independent urban retailer, but hopefully others will find it helpful as well. I have never had obligatory parties to attend* or – except when the conference was in Cotati and San Francisco – co-workers to divide the day with so I’ve always had to figure out how to get the most of the events on my own. I’m sure I can’t come up with everything so, Cheese Folks, feel free to add suggestions in the comments. We went out for a fancy meal earlier this week. I wasn’t really thinking cheese when we left the house — I don’t generally order the cheese plate at local restaurants since I get enough cheese at work. However, a side dish we ordered made me realize I had to share this. 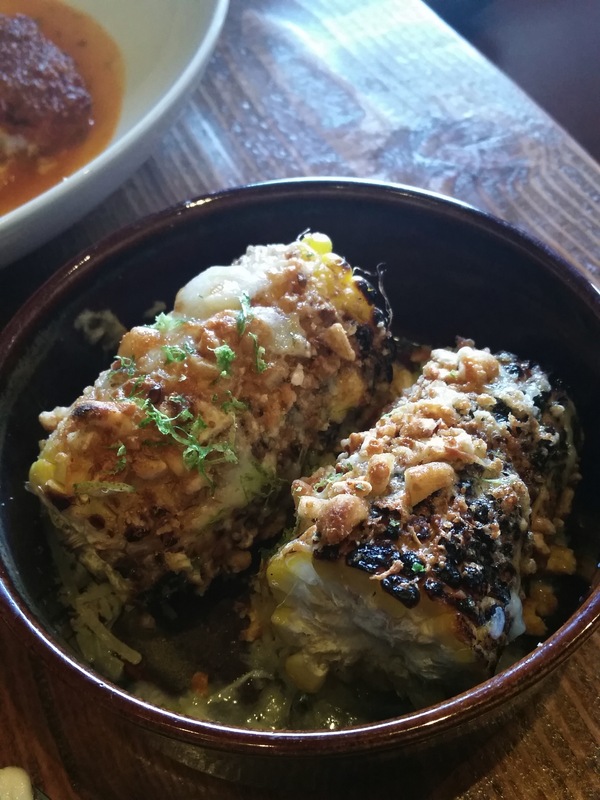 This is the roasted corn side dish at The Commissary. Best use of Idiazabal ever. One of the recurring posts I’ve often made here is “Gordon’s purely arbitrary cheese obsession of the week.” Now, I guess it’s not really “purely arbitrary.” Usually I have already decided to buy it for the store so of course I think it is really good. I just use that phrase so that folks who make similar cheeses won’t get mad thinking that I am claiming one cheese is the best when they feel they could make an argument for theirs. And fair enough… some cheeses are more consistent than others, different cheeses appeal to different palates, some cheeses have 1000 years of history while some have a few months. No, I highlight these cheeses because I am personally obsessed with them at the moment. They are what I am buying for home, often multiple days in a row. Usually they are things I also think are a little underrated, though not always. And this week, as a switcheroo, I am not even choosing a cheese for “Gordon’s purely arbitrary cheese obsession of the week,” I am choosing a butter. 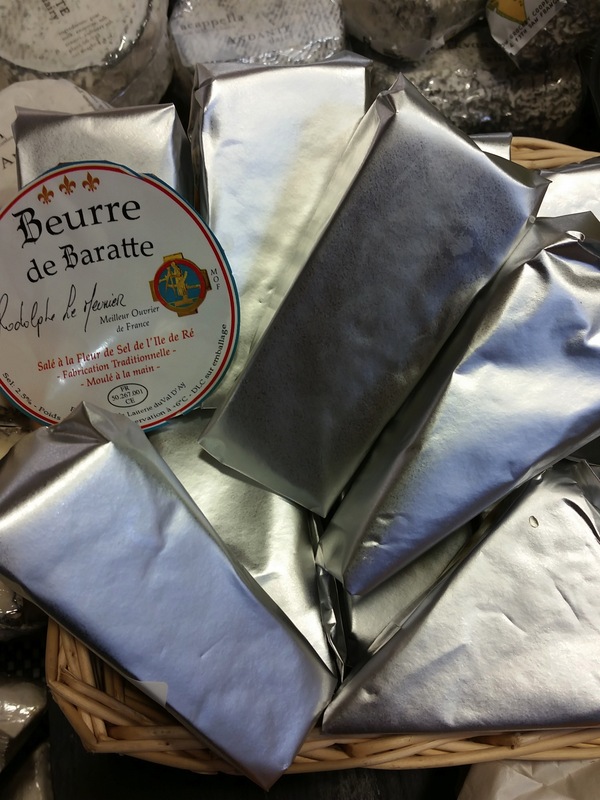 The Buerre de Baratte by Rodolphe Meunier is amazing butter. It’s churned, cultured, and full of sea salt crystals. It is deep yellow and even has a cow embossed on every wheel. I have been buying extra bread at home just so I can eat more of this butter. I accidentally bought five tubs of this amazing creation last week for the store because I misread an email and though I was buying cases of the 250g wheels. Oops… not oops. We’ve been wrapping and selling these food-service intended beauties and sampling it out like crazy. 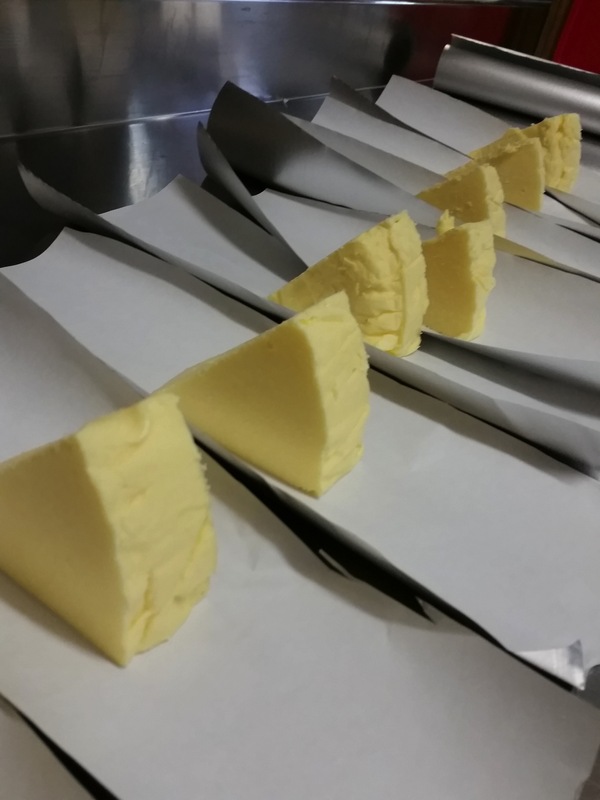 Customers are blown away when they try this, partly because they don’t often get offered samples of butter at a cheese counter. I’m writing this on my day off, but I am thinking of going to the store just to buy more of this today.